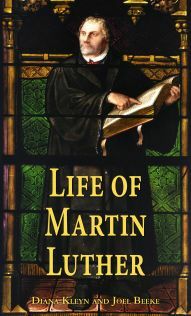 Life of Martin Luther is a concise summary of Luther’s significant life and contribution to evangelical Christianity. His conscientious search for the truth of salvation through diligent study of the Bible led to the recovery of the biblical doctrine of justification by faith alone. His advocacy for reform in the Roman Catholic Church led to the Protestant Reformation, which spread throughout Germany, France, The Netherlands, Scotland, Sweden, and England, and became a major influence upon which Western culture is formed. Every Christian should be familiar with his life, and give thanks to God for raising him up for such an important time as the Reformation. This is a reprint of chapter 5 in Reformation Heroes; complete 250 page book available from Reformation Heritage Books.